St. Paul's Cathedral in London is the seat of the Bishop of London and a major London landmark. It is located on Ludgate Hill in the financial district known as the City of London. The present St. Paul's Cathedral, which was built between 1675 and 1710, is the fourth cathedral to occupy the site, which was sacred even before Christianity arrived. The cathedral's immediate predecessor was destroyed in the Great Fire of London in 1666. The cathedral enjoyed by visitors today was designed by court architect Sir Christopher Wren. Wren's original, grander plan met with considerable resistance from the conservative Dean and Chapter. The present building reflects a compromise, but still reflects the grandeur of Wren's design. The see of London dates from 604 AD, and its cathedral has always been situated on Ludgate Hill and dedicated to St Paul. Long before Christianity arrived in Britain, Ludgate Hill was already a sacred site. It is believed that it was originally the site of an ancient megalith and then later a temple dedicated to the goddess Diana, in alignment with the Apollo Temple which once stood at Westminster. The first cathedral was built by the Saxons in wood. It burned down in 675 and was rebuilt, again in wood, ten years later. After this version was sacked by the Vikings in 962, the "second" St Paul's built, this time mainly in stone. The third St Paul's (known as Old St Paul's), was begun by the Normans aftered the late Saxon cathedral suffered in a fire of 1087. Work took over two hundred years, and a great deal was lost in a fire in 1136. Nonetheless the roof was once more built of wood, which was ultimately to doom the building. The church was "completed" in 1240 but a change of heart soon led to the commencement of an enlargement programme, which was not completed until 1314. The cathedral was however consecrated in 1300. It was the third longest church in Europe at 596 feet (181 metres) and boasted one of Europe's tallest spires at some 489 feet (149 metres). By the 16th century the building was decaying. In 1549 radical preachers incited a mob to destroy many of the interior decorations. In 1561 the spire was destroyed by lightning and it was not replaced. England's first classical architect Sir Inigo Jones added new west front in the 1630s. "Old St Paul's" was ruined in the Great Fire of London of 1666. While it might have been salvagable, albeit with almost complete reconstruction, a decision was taken to build a new cathedral in a modern style instead. Indeed this had been contemplated even before the fire. Work on the present cathedral commenced in 1675, and was completed on October 20, 1708, the 76th birthday of its architect, Sir Christopher Wren (1632-1723). It is built of Portland stone in a late Renaissance to Baroque style. Its impressive dome inspired by St. Peter's Basilica in Rome, rising 108 metres (365 feet to the cross at its summit, i.e., one foot for each day of the year), makes it a famous London landmark. In 2000, the cathedral began a major restoration program, scheduled for completion in 2008, to celebrate the 300th anniversary of its opening. The restoration programme is expected to cost £40 million, and involves not only repair and cleaning of the building, but also improvement of visitor facilities - such as accessibility for the disabled and additional educational facilities. Like most Christian churches, St. Paul's Cathedral is laid out in the shape of a cross. The longer end of the main arm of the cross is called the nave; the two ends of the shorter arm are called the transepts. At the "top" of the cross is the choir and the altar, where the sacrament of communion takes place. Where the cross' two arms intersect is a great dome, marked by a great circle on the floor beneath it. The crypt is in a basement underneath the cathedral. The West Porch, approached from Ludgate Hill, is the main entrance to St. Paul's. This is where Prince Charles and Lady Diana emerged as husband and wife in 1981. A large stairway leads up to six sets of double columns and the Great West Door. The towers that have become distinguishing marks of the London skyline were not part of architect Christopher Wren's original plan. He added them in 1707, when he was 75 years old. Both were designed to have clocks, but now only the tower on the south (right) side has one. As you enter the cathedral, you are in the nave - the main part of the cathedral that stretches out in front of you under the high, domed ceiling. The large, open space is intended to hold large congregations for services. The floor of the cathedral is tiled in a black and white checkerboard pattern. The narrower hallways between the pillars and the walls on either side of the nave are the north and south aisles of the sanctuary. The small domes above the aisles imitate the larger ones of the nave. Up ahead is the Great Circle under the dome and, beyond that, the Choir (Quire in English spelling) and High Altar. Within the cathedral are plaques, carvings, monuments and statues dedicated to a wide range of people. The bulk are related to the British military with several lists of servicemen who died in action - the most recent being the Gulf War. There are special monuments to Admiral Nelson and to the Duke of Wellington (on horseback, unveiled in 1912) in the south transept and north aisle, respectively. Also remembered are poets, painters, clergy and residents of the local parish. On the left (north) is a monument to Lord Leighton and on the right (south) is a memorial to an 18th-century naval hero. On the south aisle, in the central transept, is a monument to Thomas Middleton, the first Anglican bishop in India. There are also lists of the Bishops and cathedral Deans for the last thousand years. The nave has three small chapels in the two adjoining aisles. To the left (north aisle) is St. Dunstan's Chapel, which was one of the earliest parts of the cathedral to come into use. It was originally known as the Morning Chapel, as it was designed to be the place where the clergy and a small congregation would say the morning office (set of prayers). In 1905 it was dedicated to St. Dunstan, who was Bishop of London and Archbishop of Canterbury over 1,000 years ago. It originally had no altar, as it was not intended for the celebration of communion, but was richly decorated in purple and red silk curtains and cushions. All Souls Chapel is further down on the left side (north aisle) All Souls contains a beautiful pieta of Mary and Jesus and is dedicated primarily to soldiers of World War I. The Chapel of the Order of St. Michael and St. George is across from St. Dunstan's on the right side (south aisle). This was originally the consistory court - the place where the bishop sat in judgment over the clergy, or priests. It was used as a studio for the construction of Wellington's monument between 1858 and 1878. Entrances to the downstairs crypt are in both transepts, on either side of the dome. St. Paul's substantial cathedral crypt contains over 200 memorials as well as another chapel and the treasury. Members of the royal family are buried in Westminster Abbey, but many other notable figures are buried in St. Paul's Cathedral crypt, such as Florence Nightengale and Lord Nelson. Sir Christopher Wren, the architect of the cathedral, was fittingly the first person to be buried here, in 1723. The inscription on his burial slab states, "Reader, if you seek his memorial, look all around you." Look for Wren's tomb all the way to the east end of the crypt, under the altar. The treasury has very few treasures. Many were lost over the years and in 1810 a major robbery took almost all of the remaining precious artifacts. The main space of the cathedral is centred under the dome, which rises 108.4 meters from the cathedral floor. At 360 feet (110 meters), it is the second largest dome in the world after St. Peter's Basilica in Rome. The inside of the dome is decorated with frescos by Sir James Thornhill, the most important painter of Wren's time. The dome contains three circular galleries - the internal Whispering Gallery, the external Stone Gallery and the external Golden Gallery. The Whispering Gallery derives its name from its unusual acoustics, which cause whispers to echo around the dome. The entrance to the galleries is at the right side (south aisle), just before the dome. Climb the 259 steps to try out the Whispering Gallery and enjoy the view from the Stone Gallery. The Golden Gallery is at the highest point of the dome, under the lantern. The choir extends to the east end of the dome. It is home to the cathedral's great organ, which was ommissioned in 1694. The current instrument is the third biggest in Britain with 7,189 pipes and 138 stops; it is enclosed in an impressive case built by Grinling Gibbons. The wrought ironwork screens in the choir aisles were created by Jean Tijou, a Huguenot refugee. The bishop's throne (cathedra), from which a cathedral derives its name, is on the south side of the choir. The choir ceiling is covered with glittering mosaics created by William Richmond in the 1890s. Originally, the cathedral had a simple table for an altar. Today's very ornate high altar dates from 1958 and is made of marble and gilded oak. It replaces a large Victorian marble altar and screen, which were damaged by the bombing during World War II, and is based on a sketch by Christopher Wren. The Apse is the semi-circular east end of the Cathedral, which in St. Paul's is behind the High Altar. It was destroyed in the second World War by a bomb. After it was rebuilt, this space was consecrated as the American Memorial Chapel in November 1958. Personal visits (April 15, 2006; April 22, 2006; November 21, 2007). 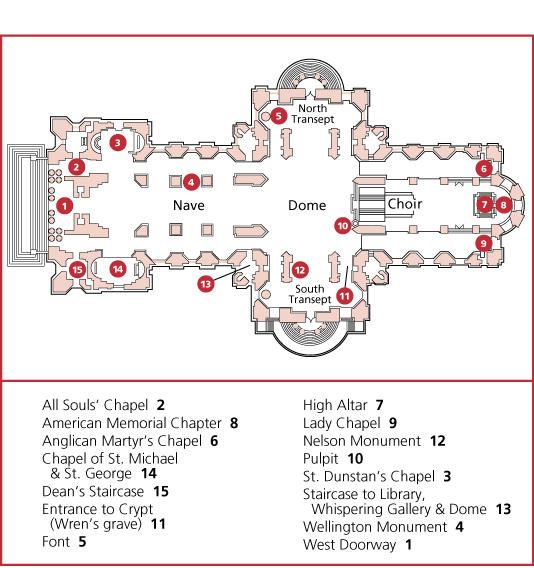 Below is a location map and aerial view of St. Paul's Cathedral. Using the buttons on the left (or the wheel on your mouse), you can zoom in for a closer look, or zoom out to get your bearings. To move around, click and drag the map with your mouse.